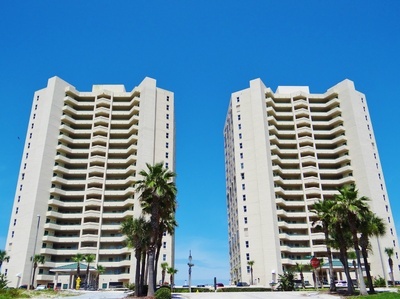 The two DiMucci Twin Towers were constructed in 2007 and boasts 19 stories of high rise luxury in Daytona Beach Shores. This complex is conveniently located just north of the Dunlawton Bridge on Atlantic Ave. Each unit has volume ceiling, granite in kitchens, balconies, and lots of glass and sliders to enjoy views of the ocean! Direct Oceanfront 3 Bedroom 3 Bath Furnished Unit. Tile Throughout. Granite Counter Tops. Breathtaking Views Of The Atlantic Ocean And The Intra Coastal Waterway.private Inside Laundry. Water Included.